The field concerning the interactions among cells and molecules of the immune system, and how such interactions contribute to the recognition and elimination of pathogens. Humans (and vertebrates in general) possess a range of nonspecific mechanical and biochemical defenses against routinely encountered bacteria, parasites, viruses, and fungi. The skin, for example, is an effective physical barrier to infection. Basic chemical defenses are also present in blood, saliva, and tears, and on mucous membranes. True protection stems from the host's ability to mount responses targeted to specific organisms, and to retain a form of “memory” that results in a rapid, efficient response to a given organism upon a repeat encounter. This more formal sense of immunity, termed adaptive immunity, depends upon the coordinated activities of cells and molecules of the immune system. Several types of cells play a role in protecting the body from infection, and they are found primarily in the blood and lymph. Specific immune responses mainly involve the activities of T-lymphocytes and B-lymphocytes, two types of white blood cells. A response is initiated when a pathogen triggers the activity of one or both of the two major types of T-cells: CD4+ cells, also known as helper T-cells (TH); and CD8+ cells, also known as cytotoxic T-lymphocytes (CTL) [see illustration]. When CD8+ T-cells are triggered, they release factors that kill a cell harboring an infectious agent, and they also release cytokines. Virus-infected cells commonly are the targets of cytotoxic T-lymphocytes, since viruses need to get inside a cell in order to reproduce. 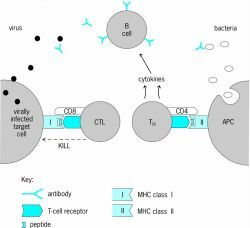 Antigen recognition, as mediated by the T-cell receptor–MHC–peptide interaction, is necessary, but generally it is not sufficient for the initiation of an immune response. Several other molecular interactions occur between molecules on the T-cell surface and those on the antigen-presenting cells. The co-stimulation provided by these additional interactions drives the production of cytokines by T-cells and induces their proliferation. The study of the cells of the lymphoid organs, which are the main agents of immune reactions in all vertebrates. The Cellular Immunology and Molecular Pathology Section of St.
degree in cellular immunology and microbiology from Moscow State University. Many of these laboratories use very advanced molecular and cellular immunology tools and equipment. A number of techniques involving cellular immunology and molecular biology were used to demonstrate the anti-inflammatory properties of mucus. chief of the Cellular Immunology Section of the NIAID Vaccine Research Center and principal investigator of the trial. His specialized training includes many years of technical and research experience in cellular immunology and molecular biology. FCAP-CAP, Cellular Immunology and Histocompatibility Laboratory, Henry Ford Hospital; * OPO Representative--Boyd Ward, Arkansas Regional Organ Recovery Agency; * Transplant Coordinator Representative (vote for one)--Tracy Evans Walker, RN, CNP, CCTC, Cleveland Clinic Foundation. Professor of Cellular Immunology, John Gordon said: "This is an exciting next step towards using a modified form of MDMA to help people suffering from blood cancer. Dr Luis Graca, of the cellular immunology unit, said: "A short treatment has long-lasting effects, suggesting it might even cure it. He combined clinical and experimental tools to not only understand the basic tenets of cellular immunology but also to apply the findings to the understanding of diseases as well as the action of drugs that affected the immune response. ERNELLE FIFE received an MS in Cellular Immunology from Northwestern University before attending Georgia State University in Atlanta, where she received her MA and PhD in English literature.